Carla Thomas’ Red Kite Fundraising Morning Tea! 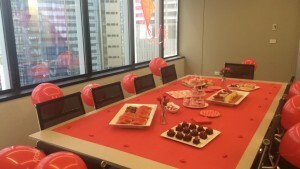 On Friday the 12th of February, Carla Thomas, our QLD Commercial consultant held a fundraising morning tea in our Brisbane office for the Red Kite Foundation. The Red Kite Foundation have been providing essential support to children and young people with cancer, and their families, for over 30 years. They are with them throughout the whole cancer journey, from the moment of diagnosis until after treatment finishes. The Empire Group girls and the Blackston Lawyers team (who share a floor with us here in Brisbane) raised a total of $310 on the day for this great cause! /wp-content/uploads/2017/03/empire_logo_MID_withoutpeople_Edited.png 0 0 alison /wp-content/uploads/2017/03/empire_logo_MID_withoutpeople_Edited.png alison2016-02-19 07:30:592017-12-01 14:19:29Carla Thomas’ Red Kite Fundraising Morning Tea!